We are proud to announce that the prestigious German magazine Aerokurier has nominated Zefhir as a candidate for the “Leserwhal 2019” Innovative Product Award in the Helicopter Category. The Award winner will be chosen by the Aerokurier readers from a list of five candidates. 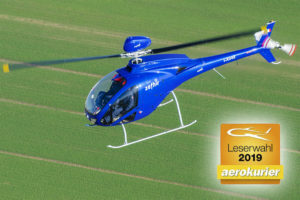 Irrespective of the results that will be announced during the AERO 2019 Show, this nomination is an important acknowledgment of the innovative nature of our helicopter: the first equipped with a fully tested parachute safety system. ‘Safety First’ is our motto: safety in aviation is a prerogative that we follow in our design and in all our daily activities. And being a leader in safety is the best innovation of all! Vote for Zefhir, the biggest step forward in the small helicopter segment in recent times! SEE YOU AT AERO 2019 IN FRIEDRICHSAFEN! 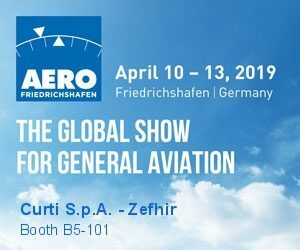 Zefhir looks forward to meeting old and new friends at AERO 2019, the most important European event for General Aviation. AERO will take place in Friedrichshafen (Germany) from the 10th to the 13th April 2019. Come and see us at our Booth B5-101, where we will show you Zefhir’s progress and upgrades. More information on the program of the events during the show will be communicated soon: stay tuned! Come and discover Zefhir, a new milestone in the air mobility of the future!